When I wanted to go to art school in 1968 my father told me I would never make a living as an artist. I looked into graphic design, put myself through art school and upon graduation I found a job as a keyliner with a magazine publisher. Keylining was the art of putting down strips of type, drawing outlines for the photos, dropping in ads, etc. It was fine handwork, type was coated with wax and rolled down firmly. Sometimes an exacto knife was used to fix words by cutting out letters and fitting them back together. As the pages were completed, they were stacked in order till the magazine was complete and was sent to the printer. It was like piecing blocks together and sending the top out to be machine stitched. One of my jobs was finding photos for ads. I learned to find images that evoked the desired emotion to sell the product. I found this fascinating and at home did collages using photos from magazines. 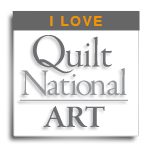 I discovered art quilts on a visit to Quilt National in 2001. I wanted to be an art quilter, an art quilter who used photos and cloth. I knew about Jean Ray Laury and the technology of digital printing but I wanted big photos! I solved this problem after a class with Fran Skiles where I learned to take Xerox copies and massage them into cotton duck with massive amounts of gel medium. 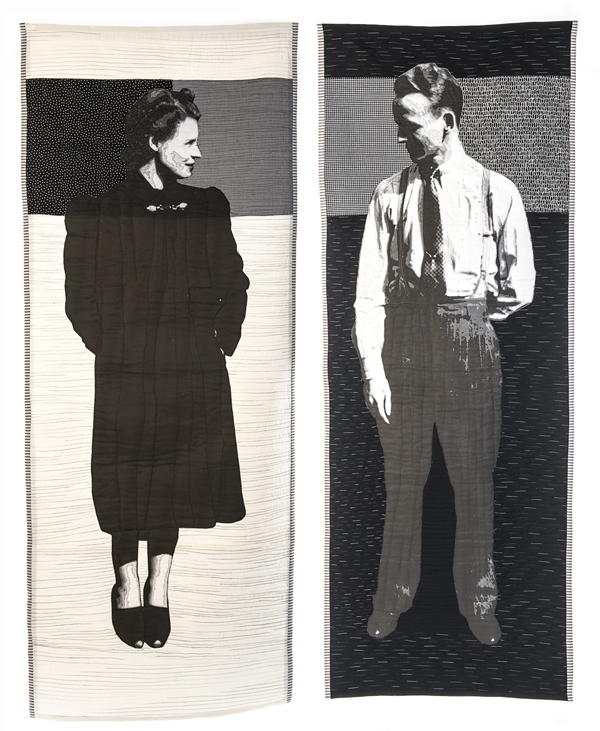 I have one piece that incorporates 27 11 x 17 xerox pages to make a seven foot tall quilt from a photo of my mother but the cloth was so stiff that stitching was near to impossible. In 2011 I discovered the world of large digital prints directly to cloth. Since then I have been exploring the world of stitching to enhance the content! I think my work in graphic design has influenced the content in my art, how to send a message or evoke a feeling. Mary Ann Tipple is a resident of Elyria, Ohio. Her mother taught her to sew at a young age. Her interest in art started in the fourth grade when she decided art was the best part of the day. She began making collages in high school. A graduate of Cleveland’s Cooper School of Art with a degree in graphic design, she has worked in ad agencies as a designer and print production specialist. 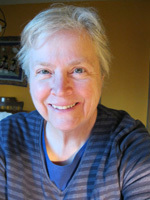 Now retired, she makes art quilts, mixed media pieces and paper collages. She credits her growth in her textiles to classes at Quilt Surface Design Symposium. An interest in improvisation comedy led to two years of classes with Second City, her love of humor shows in her textile pieces!